We will help you have a complete understanding of all the logistics. Adaptive skiing and snowboarding can come with apprehension and anxiety. You have our reassurance this adapative program comes with safety front and foremost with committed team members and volunteers. Increased awareness of your organization through social, community and local media engagement. We anticipate thousands of views and touchpoints through our platform and community event series leading up to Power Thru The Powder Weekend. We will provide a pre-packaged co-branded material set including event logos and baseline social posts you can use in helping promote the event for your participants. Soft participation in fundraising. Leveraging our co-branded materials, share Power Thru The Powder donation and sponsorship pages with your network. We will use money raised for your clients to take care of all expenses for them and their families. Our promise that this is a very safe and secure experience, in the hands of experts from STRIDE Adaptive Sports. Your clients and their families who participate will be thrilled with the level of dedication and support from the coaches. This opportunity will provide your clients a life changing experience with lots of great feedback and praise from everyone. All volunteers you have sign up will receive an event shirt. The ability for you and your staff to attend the event, and celebrate with the team. Signage at the event and website. We will also provide a table to share materials and collaterals of your programs and services connecting with families throughout the weekend. Identify and connect at least 1-2 participants ASAP that can be part of the weekend. You know your clients best! We hope to expand this event annually and eventually provide this experience for anyone who is interested. We will capture the weekend and share great photos and videos that show people enjoying and celebrating prior through the event. 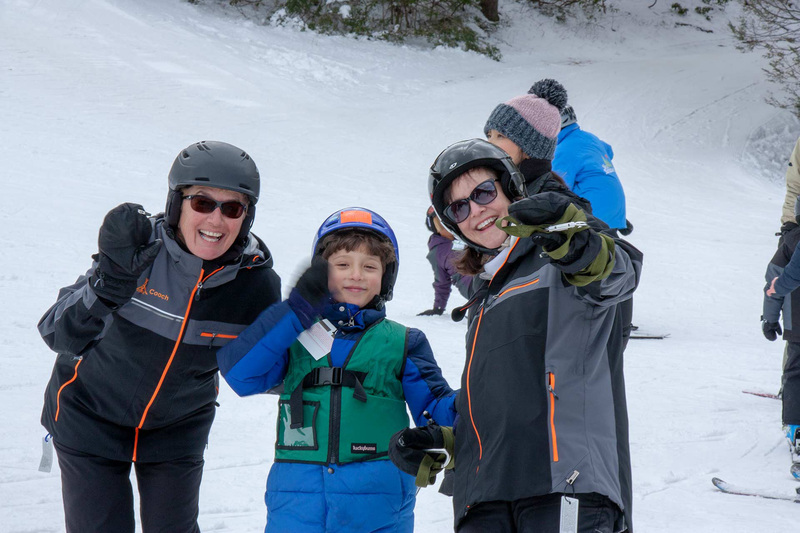 From introductions and equipment fitting to first time down the slopes, we will highlight the experience that will be made available following the event. Money back as a donation. Fundraising proceeds will be donated back to each partnering nonprofit organization. Co-branded marketing materials. We will be advertising and fundraising for this event and will need your consent to use approved logo and content on all our marketing materials including website. We require a file of your logo.